A Lake Grove woman was arrested for falsely reporting her own crime, and a victim pursued a purse snatcher until police caught the thief. A Lake Grove woman (pictured right) has been arrested after burglarizing her landlord’s residence and then falsely reporting the crime to police. Sara Hernandez called police on Wednesday, claiming a man had broken into a home on Ebzu Court. Hernandez lives in an apartment at the residence. She told police that the man had fled the scene in a red vehicle after burglarizing her landlord’s apartment. Police investigated the burglary, and found that Hernandez had committed it herself and falsely reported the crime. 25-year-old Hernandez was arrested on Thursday. Hernandez is being charged with Burglary 2nd Degree, Falsely Reporting an Incident 3rd Degree, Making a Punishable False Written Statement, three counts of Criminal Possession of a Controlled Substance 7th Degree and two outstanding warrants. 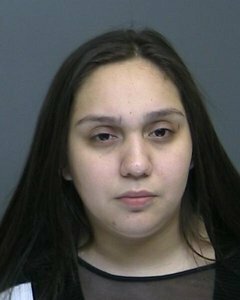 She was arraigned at First District Court in Central Islip. According to NCPD Detectives, a 44-year-old female victim, was robbed while inside McDonald’s located on Wantagh Avenue. The victim left her pocketbook unattended while cleaning off the table when Michelle L. Hendrickson, 31, of 3541 Naomi Place Seaford did grab the pocketbook and attempted to leave the store. The victim tried to take back her purse and a struggle followed; the defendant was able to get away and leave the restaurant with the pocketbook. The victim followed the purse snatcher to the train station where officers were able to place the defendant under arrest without incident. The victim’s purse was recovered and no injuries were reported. Hendrickson is charged with Robbery 3rd Degree and was arraigned today, March 30, in the First District Court 99 Main Street Hempstead. Subject: LongIsland.com - Your Name sent you Article details of "Crime Report: Woman Arrested for Reporting Burglary she Committed; Purse Snatcher Caught in Wantagh"